What time is it? Is it eight or nine or ten? 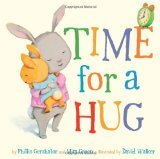 Whatever time it is, it’s Time For a Hug! In this adorable board book, a mother rabbit and her son spend the day together. Playing, baking, eating, and getting ready for bed, they notice as the clock ticks off every hour. And any time is just right for hugs. Counting, learning time, and fun are all featured, as is the strong bond between mother and child. Time For a Hug will be a favorite for all loving families. I highly recommend it.